"Four sisters desperately seeking the blueprints to life-the modern-day retelling of Louisa May Alcott's Little Women like only Anna Todd (After, Imagines) could do. The Spring Girls-Meg, Jo, Beth, and Amy-are a force of nature on the New Orleans military base where they live. As different as they are, with their father on tour in Iraq and their mother hiding something, their fears are very much the same. Struggling to build lives they can be proud of and that will lift them out of their humble station in life, one year will determine all that their futures can become. The oldest, Meg, will be an officer's wife and enter military society like so many of the women she admires. If her passion-and her reputation-don't derail her. Beth, the workhorse of the family, is afraid to leave the house, is afraid she'll never figure out who she really is. Jo just wants out. Wishing she could skip to graduation, she dreams of a life in New York City and a career in journalism where she can impact the world. Nothing can stop her-not even love. And Amy, the youngest, is watching all her sisters, learning from how they handle themselves. For better or worse. 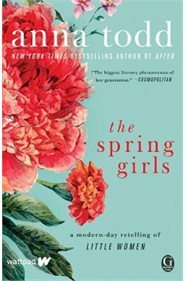 With plenty of sass, romance, and drama, The Spring Girls revisits Louisa May Alcott's classic Little Women, and brings its themes of love, war, class, adolescence, and family into the language of the twenty-first century."